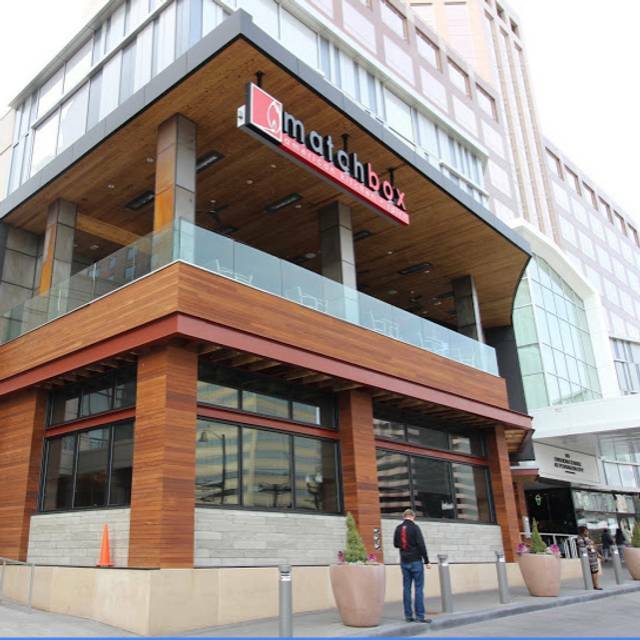 You must make reservations at least 5 minutes in advance of the time at Matchbox - Pentagon City. 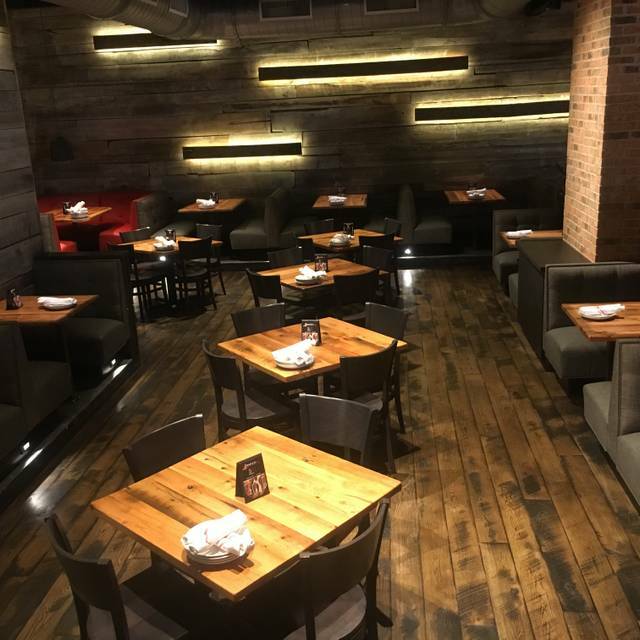 Located in the Fashion Centre at Pentagon City, directly at the Metro station, the mezzanine accommodates all parties up to 150 guests. The jewel of Fashion Centre, our 12,000 square-foot refuge offers fuel for shopping, including a breezy terrace that overlooks the bustling streets of Pentagon City. Spanning two levels, with a mezzanine that accommodates up to 150 guests, there’s plenty of space for intimate dinners, large parties and get-togethers. Have a seat at the airy 8-seat pizza bar where bubbling, thin-crust pizzas make their debut, or wave to the people below from a private booth in the sky. It’s hard to ignore the industrial glass and steel elevator, or feel the warm, primal fires from two wood-burning ovens. Enjoyed a well-prepared burger at Matchbox. It was uncharacteristic in that it was not busy, so not too noisy. The service was a little off. The folks delivering food to tables seemed new and would have to go from table to table to see if this is what you ordered. 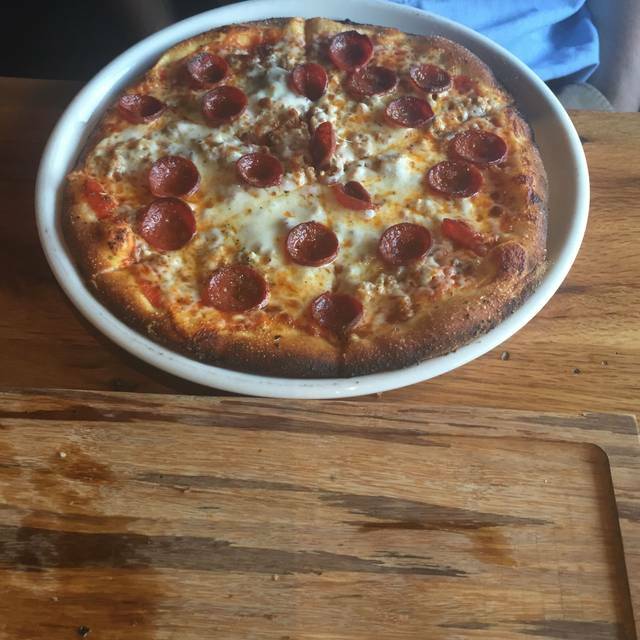 Food was good, especially the pizza. That would be the safe order at this location. Nice beer selection in that I like Amber Ale and many places seem to leave that off the beer menu. Was there the night before and had horrible service, manager took care of some drinks and an appetizer to make it right and gave us a great server, Jill. Came back the next day for lunch, had the same waitress from the night before and it was a much better experience. Food is awesome, they have a brunch option for like $32 and you can order what you want from that menu for two hours. We didn’t do it this time but the table next to us did and it looked awesome. Overall good experience. Food is always good and the staff is attentive. It was particularly loud during this visit. But then it was Friday and there were several groups celebrating. Always a consistently good experience! We waited 15 minutes before I asked if we had a server and a server who didn’t have our particular table came to help. My son’s milk never came. 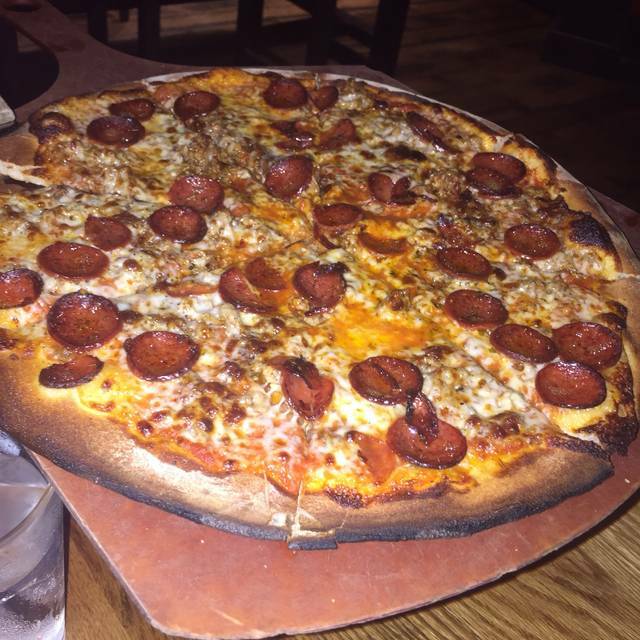 A pizza we didn’t order started to get dropped off (clearly at the wrong table). The server who had that section was clearly in the weeds and the host kept seating that section, while other servers were just standing around. I've eaten here a few times, and every experience has been different, but I would give it the same rating every time. The food is usually consistently good. My only hang-ups are with the service and the timing. My last visit, it was a struggle to get the server to refill our waters. Food took a little longer to come out than I would have expected and the volume of the restaurant hadn't picked up yet (5pm reservation). We ordered appetizers and the entrees came out shortly after, while still eating the appetizers. Our appetizer dishes were left on the table the entire meal, so though it was just two of us eating, it was still crowded at the table. I enjoy the food and the ambience of the restaurant but I feel there are still growing pains with the staffing of the restaurant. I have faith that it will get better. Arrived at 1130a. Food did not arrive till 1215 because kitchen messed up the order for 3 small pizzas. Meanwhile, the tables that sat after us received their food. Waiter also came out with pizzas that we did not order and offer as an alternative for something to eat while our actual pizzas were made. Been to this location several times and others, never did we experience such horrible service. We ended up packing our regular ordered pizzas to go. 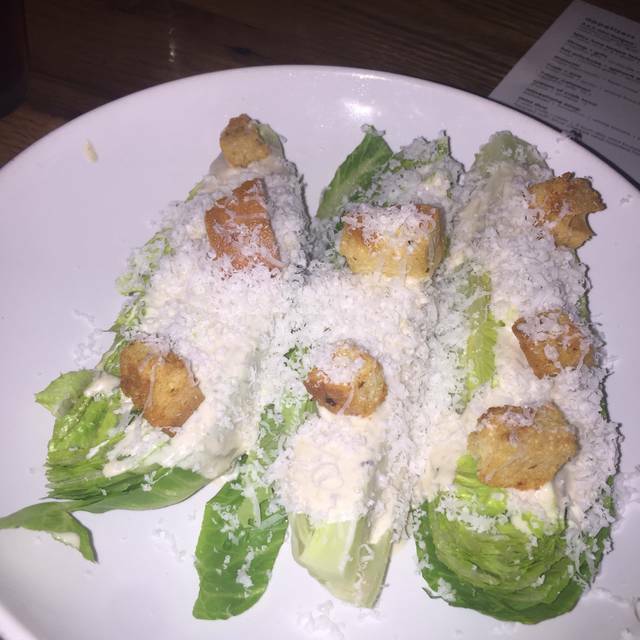 Matchbox in Pentagon City offers great happy hour food and drink choices! The food and service are very good. On Friday evening it can get quite loud because it is busy, but sitting upstairs works fine for visiting with fellow diners. The server was not friendly or engaging. The food arrived warm at best if not cold, over several courses. We mentioned our dissatisfaction to the manager who responded positively and it was appreciated but the damage was done. We were very disappointed and will not be returning any time soon. The service was poor, the food ok- some things were much better than others. Ribs not so good. Spinach artichoke dip very good. It took a long time for drink order to arrive, appetizers and entrees. We lost our server mid meal and our bill came with items on it from another table. The servers were pleasant but it just seemed that overall management was not great. I don’t need to come back here again. The food was amazing and our waitress Lindsey went above and beyond. I can’t wait to go back. 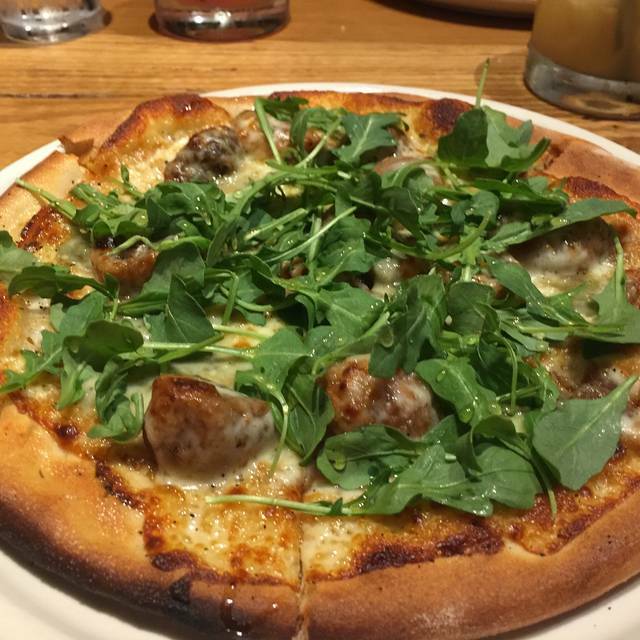 Ordinarily, I rank Matchbox as one of my favorite places to eat and plan to return. Service can somewhat be a mixed bag however, so definitely pay attention (especially to the bill). 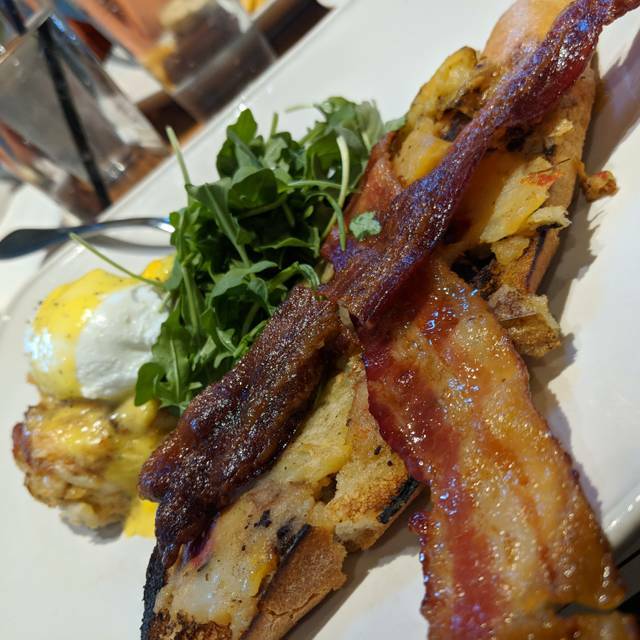 We tried their bottomless brunch for the first time and really enjoyed it. $30 a person was a very good deal. The service could have been a bit more prompt but overall we had a good experience. Very nice. Would come here everyday. Waiter was great and patient gave us excellent service. The food is always good after several attempts to get the correct order delivered to the table. I am a regular and experience the same service every visit, regardless of the server. They also regularly experience trouble splitting checks. I hear this from many of my neighbors who also frequent this restaurant. Management may want to clarify a split checks policy to patrons and servers; e.g. institute a streamline process or inform patrons that checks will not be split. Initially got my order wrong but they made up for it and the rest of the table was cared for very well. Food was great and so was the server. Always a cool atmosphere and the warm winter day made sitting on the balcony amazing. Definitely a favorite restaurant and will be back in the future. The service was very slow, and the wait staff was not attentive. My frustration level increased the longer we were there. We sat at the table a full 45 minutes before our drinks arrived. Overall, this was a very disappointing experience. The last time I ate here, three weeks ago, I wasn’t sure that I would return due to the slow service. Now, there is almost no way that I would return. I’ve been there before and it was fine but on this night the service was terrible. Waiter left us at least 25 minutes until we wrangled another waiter to take our order. .We had to ask another staff member to bring our bill. And then when we were leaving he finally brought the beer we ordered a long time before. The beer that never came was on the check but they kindly removed it. The calamari salad was disappointing. Literally some calamari on top of a pile of spinach, not much else to it. This was the first time my guest was there and they were not impressed. Excellent food and excellent service. My children enjoyed it and I loved it. Dinner was wonderful! The service is amazing! Megan is awesome! Awesome ribs and great beer selection! This particular Matchbox certainly thrives and survives on the strength of tourism. Our waitress was wonderful thank you Michelle, our food was not even warm, had to wait for new fries, crab cake was very sloppy. It’s a great disappointment this to around because it was a xo worker leaving and I spoke highly of this place. Do better. 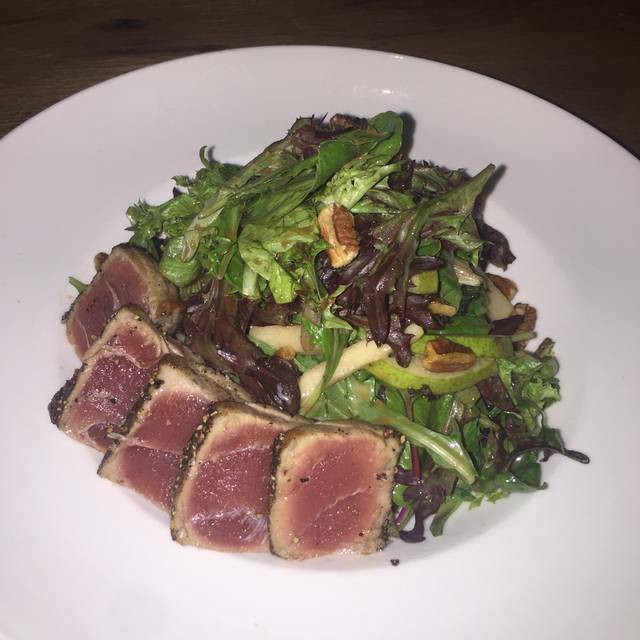 What can go wrong at Matchbox with such awesome food! I love this location as it is well laid out with plenty of seating. I strongly recommend this place to anyone visiting DC! Great attentive staff. First time there and waitress was so enthusiastic and helpful! High Quality food at a decent price. Perfect for casual yet nice date, and great for a nice sit down lunch break! The restaurant was slow and at least half of our food was incorrect. I've been there three times and it's happened twice with very simple things. The noise level was much better this time. The food is good. The atmosphere, when the music isn't so loud, is great. The service stinks. Mediocre food, really nothing special. But had slow but attentive service. Parking is difficult. Good location. Our waiter was friendly (Gerson?) mumbled a little. Nice feel. Helps having a reservation. I had to move to three times, concierge was super friendly. 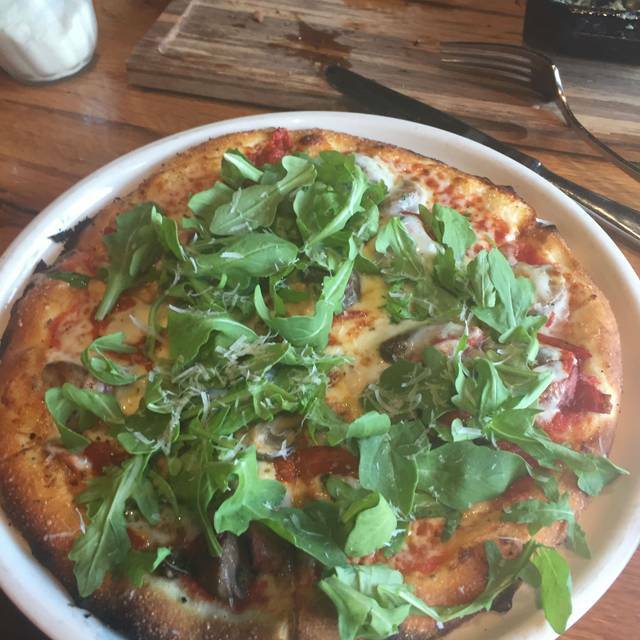 The food was great except for my friend’s pizza. It was soggy and cold. Our server wasn’t great. Then one of the food runners brought us a plate of food we said wasn’t ours. She left it at our table then left. A couple of minutes later, she said it was for another table. She took the dish from us and gave it to another table. Lucky for the other table we didn’t touch the food. The food runner shouldn’t do that. I wouldn’t want a dish that was left with another table. We could have touched the food. Gross!!! Always wanted to try March Box. I was very happy with my visit and my meal. I had the chicken Pesto pizza which was delicious. I will be going back soon.